Crayon Box heads to South Carolina, to live with Scott Johnson. He had a good bit of input into its final construction; he chose the size as well as the backing/binding, a very dark, foresty green color. 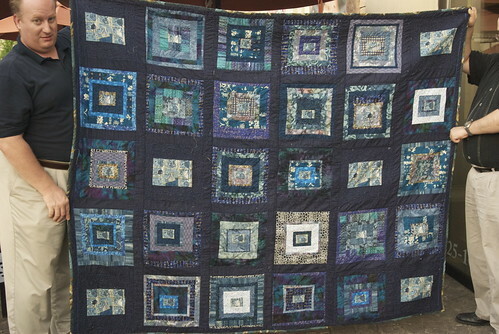 It goes in the mail this afternoon, so I feel pretty justified in calling it "completed" on the quilts page. The goal is to decimate the "works in progress" list this week. Crayon Box and Lost in Translation are done. Penmanship is being quilted at home, and I hope to finish it in the next couple of days. White Librarian finally gets longarm quilting time on Saturday. If I can secure another Saturday on the longarm quilter, I could get Red Librarian done, as well. Okay, that was such a load of crap that even I couldn't finish the sentence. Yeah, I'm juggling my usual load of projects. Once 'Penmanship' is done quilting, I can reset the machine for standard sewing, and start assembling the flowers on Hallie's 1930s quilt, 'Remixed.' I can also do test pieces for 'Seven Brides For Seven Brothers' to see if the fabrics look right when sewn together. 'Eat This Quilt' is a snackfood project to nibble on when I'm in down time, and Adam's wedding quilt needs a complete redrafting. I'll sleep when I'm dead. When I am, someone toss a quilt over me, please. Nonsense. We'll just toss some fat quarters. You can make the quilt yourself. Pardon me while I glare at you. Can't wait to see the White Librarian quilted. 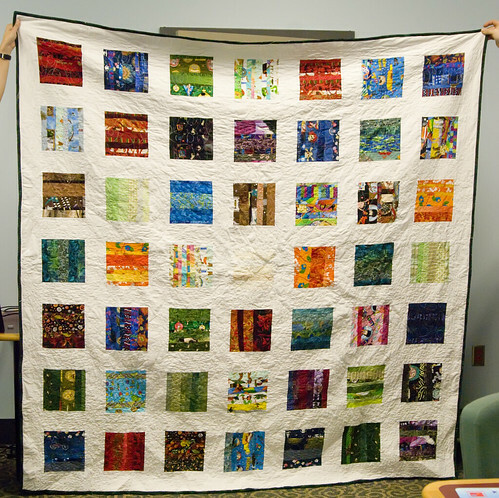 That's an amazingly beautiful quilt, both design and fabrics.